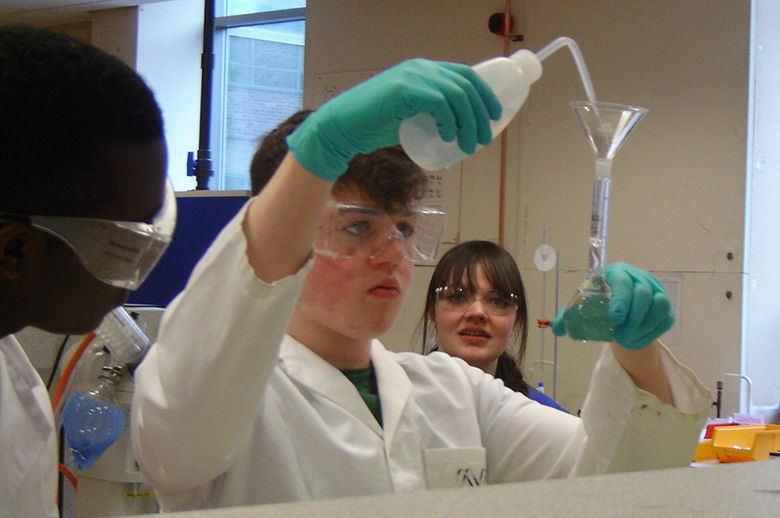 Chemistry students from The Sixth Form College, Solihull visited The School of Chemistry at the University of Nottingham this week for a full-day masterclass. The students took part in a range of exciting practical experiments, thanks to a collaboration with the University of Nottingham, which has been established for more than a decade. This collaboration gives the most committed chemists the opportunity to complete project work with the university, which significantly boosts their progression opportunities. Back in January, many Chemistry students visited Nottingham for a series of informative talks and chemical demonstrations by Dr Pete Licence, Mr Jim Gamble and Professor Sir Martyn Poliakoff. This return trip saw students participating in practical exercises involving redox chemistry and quantifying the vitamin C content of food sources. Students were introduced to advanced techniques such as infra-red spectroscopy, mass spectrometry and nuclear magnetic resonance and got a chance to use the University’s state-of-the-art facilities and technology. The students who have elected to complete a project with the University of Nottingham will now do follow up research of their own, focussing on the investigation covered in the masterclass and the techniques used. Their findings will be recorded in the form of PowerPoint presentations, which will be presented to an audience of academics at the University followed by visit to the University Open Day in June.